Discover and fingerprint IKE hosts (IPsec VPN Servers). If you plan on performing pre-shared key cracking, then you should configure ike-scan to use the OpenSSL hash functions rather than its built-in functions because the OpenSSL ones are normally faster. To do this, make sure you have the OpenSSL include files and libraries installed, and run configure as ./configure --with-openssl. Whether you use OpenSSL or not won't affect the functionality of ike-scan, just the speed of pre-shared key cracking with psk-crack. It should build on most modern Unix-like OSes. It works on Windows with Cygwin and can be used as a standalone Windows executable when cygwin1.dll is present. If you are using the Windows-32 binary package, please also read the file README-WIN32 which details the differences when running on the Windows platform. The program is known to build and run on Linux, FreeBSD, OpenBSD, NetBSD, Win32/Cygwin, Solaris, MacOS X, HP Tru64, HP-UX, and SCO OpenServer. For more details see the section "SUPPORTED PLATFORMS" below. To report bugs or suggest new features, please create a GitHub issue. The hosts to scan can be specified on the command line or read from an input file using the --file=<fn> option. The program can cope with large numbers of hosts limited only by the amount of memory needed to store the list of host_entry structures. Each host_entry structure requires 45 bytes on a 32-bit system, so a class B network (65534 hosts) would require about 2.8 MB for the list. The hosts can be specified as either IP addresses or hostnames, however the program will store all hosts internally as IP addresses and will only display IP addresses in the output (ike-scan calls gethostbyname(3) to determine the IP address of each host, but this can be disabled with the --nodns option). The program limits the rate at which it sends IKE packets to ensure that it does not overload the network connection. By default it uses an outbound data rate of 56000 bits per second. This can be changed with the --bandwidth option. If you want to send packets at a specific rate, you can use the --interval option. 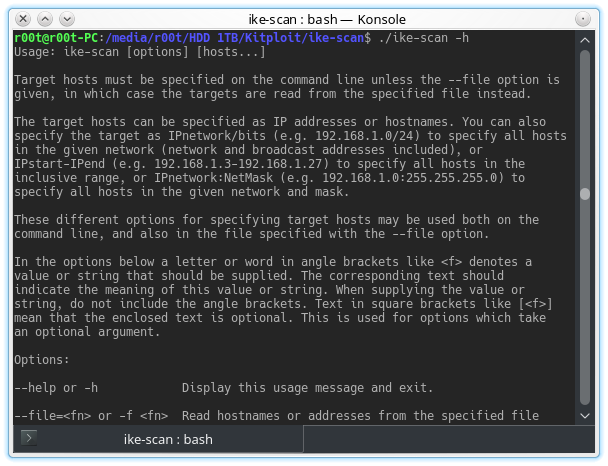 ike-scan generates unique IKE cookies for each host, and it uses these cookies to determine which host the response packets belong to. Note that it does not rely on the source IP address of the response packets because it is possible for a response packet to be sent from a different IP address than it was originally sent to. See the PROGRAM OUTPUT section for an example of this. The cookies are generated by taking the first 64 bits of an MD5 hash of the current time in seconds and microseconds as returned by gettimeofday(), the unique host number, and the host IP address. This ensures that the cookies are unique with a reasonable degree of certainty. If --verbose is not in effect, such packets are silently ignored. An IKE packet which is nothing to do with ike-scan has been received. The main mode packets sent contain an ISAKMP header and an SA payload. The SA payload contains a single proposal, and the proposal can contain a variable number of transforms as detailed below. DH Group: 1 (MODP 768) and 2 (MODP 1024). This default transform set is designed to be acceptable to most IKE implementations - most will accept at least one of the offered transforms. However, it is sometimes necessary to use a different authentication method (pre-shared key is the most common, but is not always supported), and occasionally it is necessary to specify a different cipher such as 256-bit AES. More rarely it may be necessary to change the lifetime. Finally, some implementations require a specific "Vendor ID" string to be sent by the client before they will respond. This can be specified with the --vendor option. The default transform set results in a packet data length of 336 bytes which when IP and UDP headers are added gives a total packet size of 364 bytes. It is possible to specify the Authentication Method with --auth (default is 1 - pre-shared key) and the IKE lifetime in seconds with --lifetime (default is 28800 seconds or 8 hours as recommended by RFC 2407). If you specify --lifetime as 0, then no lifetime attribute is included in the transform payloads. If you are specifying custom transforms, you can you can use this option more than once to produce transform payloads with different lifetimes. Each --trans option will use the previously specified lifetime value. It is possible to specify a custom transform set with --trans=e[/l],h,a,g where "e" is the Encryption Algorithm, "l" is the key length for variable length ciphers, "h" is the Hash Algorithm, "a" is the Authentication Method and g is the DH Group. These are specified as numeric values; see RFC 2409 Appendix A for details of which values to use. You can use the --trans option more than once to send an arbitrary number of custom transforms in the proposal. Specifying a custom transform set overrides any authentication method specified with --auth. However, it still uses the lifetime value specified in the last --lifetime option. 128-bit AES Encryption with MD5 hash, RSA authentication, DH group 5, and lifetime of 600 second. If a custom transform set is specified, the packet length will differ from the default. Fewer than 8 transforms will make it smaller, and more than 8 transforms will make it larger. If the packet size exceeds the MTU, then it will be fragmented. You may need to increase the --interval setting for large packets to avoid overloading your network connection. Some VPN servers may ignore very long packets. If you want to determine exactly which transforms a remote IKE implementation supports for fingerprinting. --idtype Set identification type (Default 3 (ID_USER_FQDN)). --dhgroup Specify Diffie-Hellman group (Default 2 - MODP 1024). If you use Aggressive Mode, then you can only use one Diffie Hellman group in the transform set. If you specify custom transforms with the --trans option, you should ensure that they all use the same group, and that this group matches the DH group specified with the --dhgroup option, or the default of 2 if --dhgroup is not specified. With an IKE notify message containing the cookie that was originally sent to the host. This is a "notify" response and indicates that the host is running IKE, but does not accept our proposal. This shows that the IKE host has responded with an ISAKMP header and an SA payload containing a single proposal. This proposal contains a single transform representing the transform chosen from the proposal sent by ike-scan. This shows that the IKE host has responded with an ISAKMP header and a notify payload. The notify payload is an informational message with the type "NO-PROPOSAL-CHOSEN". ike-scan does not respond to any of the IKE responses it receives, so the IKE main mode handshake will never complete. Some IKE implementations do not log handshakes that don't complete; these implementations will not log the scanning and therefore the owners of these systems will not be aware of the scanning. It is possible to use ike-scan to determine if a given implementation will log these scanning attempts if you have access to the system logs. For those hosts that respond, ike-scan records the times of the received IKE responses. The backoff between IKE responses varies between different IKE implementations and can therefore be used as a fingerprint. The --showbackoff option is used to display the backoff times for each host which responded. Note that using the --showbackoff option will cause ike-scan to wait for 60 seconds after the last received packet to ensure that it has seen all of the responses. This 60 second wait can be altered by specifying a different value in seconds to the --showbackoff option. When all of the packets have been received, the backoff table is displayed, and the program attempts to match the backoff pattern against the known backoff patterns contained in the text file ike-backoff-patterns. It is possible to add new patterns to this file. Note that only hosts which respond with a handshake can be fingerprinted by backoff timings; hosts which respond with a notify message cannot. This is because notify messages are only ever sent once and are not subject to retransmission with backoff. If you discover IKE hosts with backoff patterns which are not recognised by ike-scan, then you are encouraged to submit the pattern and details of the IKE implementation to me so I can incorporate it into future versions of ike-scan. You can do this by opening an issue, or a pull request on github. Note that any packet loss will prevent the backoff fingerprinting from working because the program needs to see all of the responses. Some systems (such as Checkpoint Firewall-1) allow the use of any source port (e.g. --sport=0) whereas others (e.g. Windows 2000) only respond to IKE requests from source port 500 (actually, Windows 2000 responds to requests from any port, but always sends the responses back to port 500 which amounts to the same thing). Some systems use proprietary notify message codes which allows them to be identified. For example, Checkpoint Firewall-1 4.0, 4.1 and NG Base use notify message code 9101. ike-scan recognises this and will identify the system as "Checkpoint Firewall-1 4.x or NG Base". Different systems support different transforms, and this support can be determined by trying all possible combinations with --trans. Note however, that the user can usually change the transform set, so this cannot be relied upon by itself. Different implementations require different IKE Lifetimes. Some implementations will accept any lifetime, whereas others will only accept lifetimes below a certain value. By using another tool (e.g. tcpdump) to sniff the returned IKE packets, the IP ID and IP TTL can be determined. These can be useful in fingerprinting the IP stack which can help to determine the IKE implementation. The IKE host may send Vendor ID payloads which uniquely identify the implementation. This Vendor ID fingerprinting method was first proposed by Brett Eldridge [email protected]. ike-scan will display any vendor ID payloads that it receives, and will attempt to match these against known Vendor ID patterns. The IKE backoff pattern section (if --showbackoff is specified). The IKE host detection section contains one line for each host that responds. The response can either be a successful handshake or an informational message. Only the first packet returned by any given host is displayed in this section. In the above example output, host 10.0.1.98 has returned an IKE handshake, 10.0.1.22 has returned notify message 14 (decimal) which corresponds to the RFC-defined error message "NO-PROPOSAL-CHOSEN" (see RFC 2408 section 3.14.1), and 10.0.1.189 has returned a non-standard notify message 9101 but the response has come from the IP address 10.0.1.130 rather than the address which the request was sent to (presumably this is a multi-homed system). Notify message 9101 is not defined by RFC 2408, but it is known to be a Checkpoint proprietary notify code (therefore the system is probably Firewall-1) and the program displays the text included in the notify message. Here, host 172.16.2.2 returned a total of 12 packets and the pattern matched "Firewall-1 4.1/NG", and host 10.0.1.98 returned 3 packets matching the pattern for "Cisco IOS / PIX". The recv time column shows the absolute time when the packet was received in seconds and microseconds since the epoch; delta time shows the elapsed time between packets in seconds and microseconds. The below example will run IKE detection against the single host 172.16.2.2. No backoff fingerprinting will be done, and all options (timeouts, retrys, transform set Etc) will be the default. This will read the target hosts from the file "hostlist.txt". This reads the hosts from stdin and performs both IKE detection and backoff fingerprinting. The backoff wait is specified as 20 seconds. This will run ike-scan against all hosts in the network specified by 172.16.0.0/16 (including network and broadcast addresses). In this case, this will result in a total of 65536 hosts being scanned - from 172.16.0.0 to 172.16.255.255 inclusive. This uses the range notation to scan a total of 65536 hosts from 172.16.0.0 to 172.16.255.255 inclusive. It should work, or be capable of working, on any Unix-like system which has a 64-bit integer type, supports sockets and has the system calls malloc, gethostbyname, gettimeofday, inet_ntoa, memset, select, socket, and strerror. If you port ike-scan to a system not listed above, please let me know the details of the changes required so I can add them to future releases.